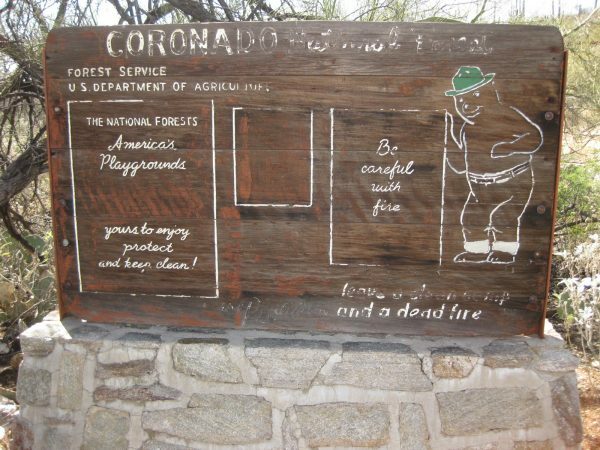 This redwood sign was near the Cactus Picnic area in Sabino Canyon in the Coronado National Forest. This area is used to host school groups. 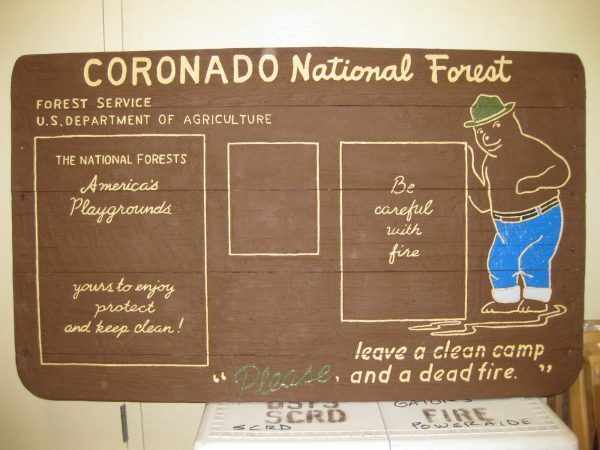 Smokey is looking like he could use a little sprucing up. Here is a detail of the deterioration. 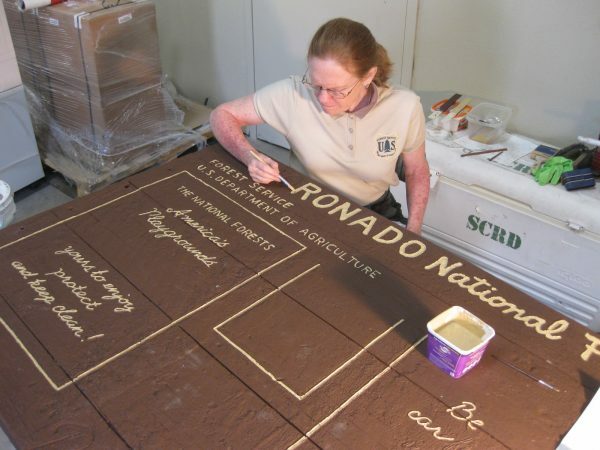 The paint kept the carved out letters from aging so they protruded from the background. 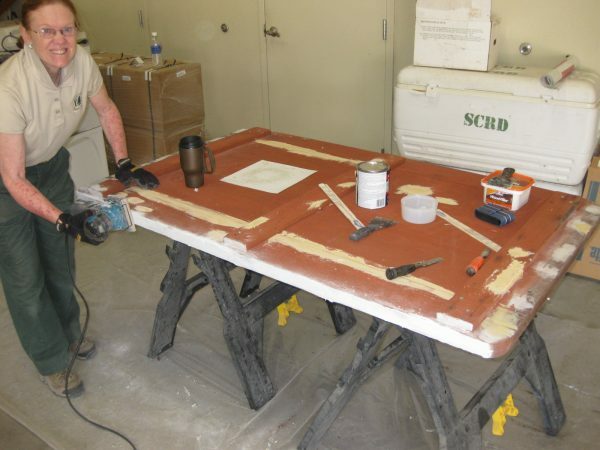 We used Bondo on the edges to give a strong weather protection. 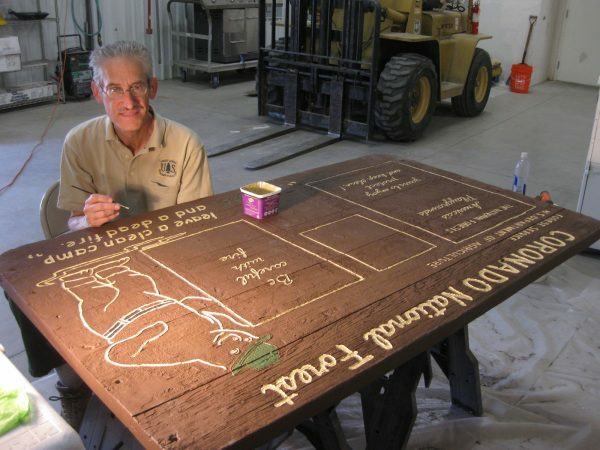 There is also some wood filler. We had to reattach the boards with new screws. We patched the old bolt holes to keep the water from penetrating as well as patching some of the larger deterioration spots. 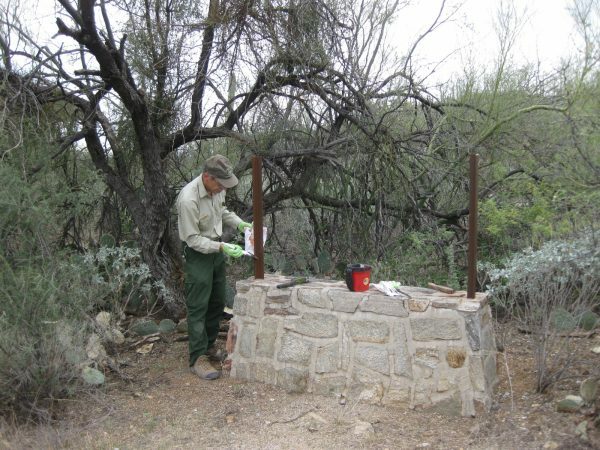 In the field, we cleaned up the vegetation and repainted the sign metal supports. 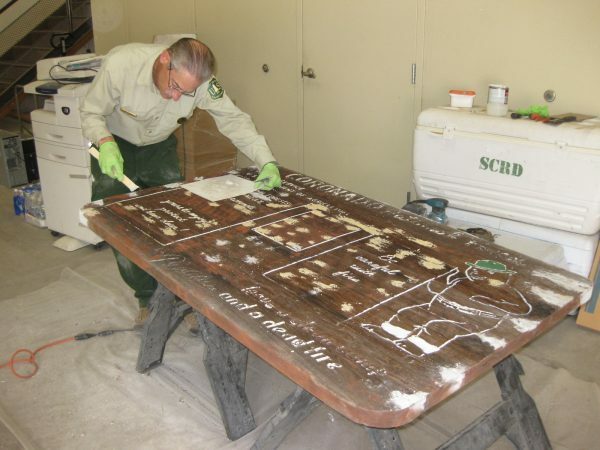 We painted the entire back ground Forest Service ‘Brown’ before painting the details with ‘Adobe’. Using a very fine brush and lots of patience! After extra indoor drying time, Smokey is ready to return to the forest. Well here we are flanking the restored sign! 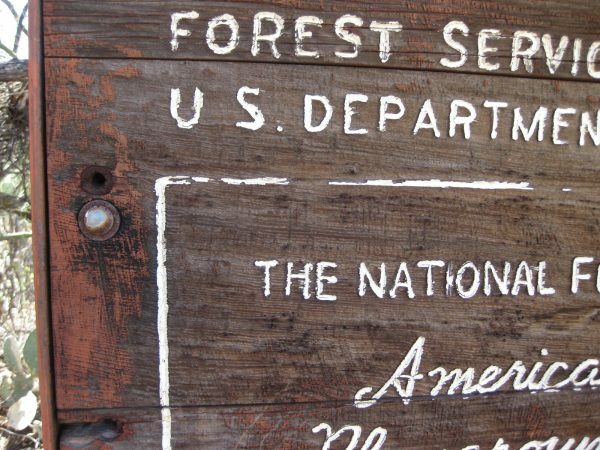 This project maintains the legacy of those before us that carved this sign for their care and love of the forest. 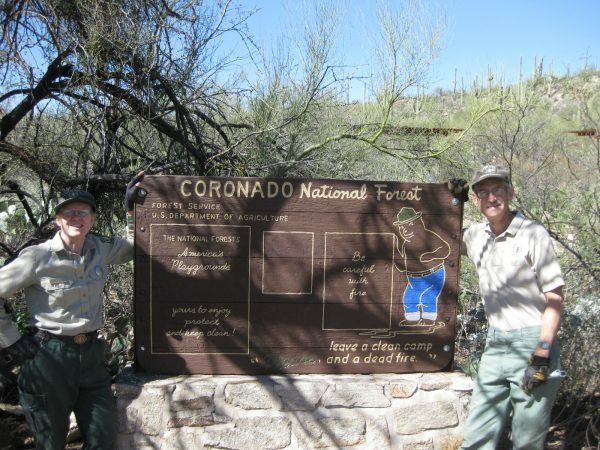 We are proud to give this sign many more extra years of life to reach more of the visitors to this picnic area. 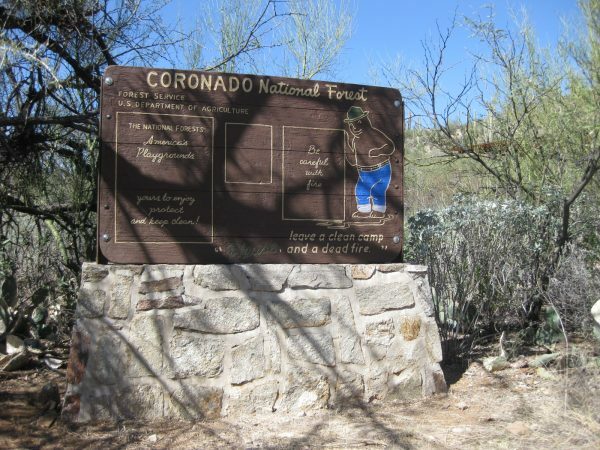 This entry was posted in Arizona, Art, National Forests, Sabino Canyon, Tucson. Bookmark the permalink.